Red Sox Lead Series 3-2, But .733 Is The Stunning Number : The Two-Way Boston's David Ortiz is flirting with a World Series record. He's got 11 hits in 15 at-bats. That .733 batting average eclipses the rest of his team's. Boston players not named Ortiz are hitting .144. The Sox could wrap up the championship Wednesday. St. Louis hopes to extend the Series to a Game 7. The headline from Monday night is that the Boston Red Sox beat the St. Louis Cardinals by the score of 3-1 to take a 3-2 lead in the best-of-seven World Series. Game 6, which could make the Red Sox the world champions, is Wednesday night in Boston. It starts just after 8 p.m. ET and will be broadcast on Fox. If the Cardinals win Wednesday, Game 7 would be played in Boston Thursday night. For us, the eye-popping number of the Series so far is .733. "All Red Sox players not named David Ortiz have combined for just 22 hits in the World Series. That's a batting average of .144." According to BaseballReference.com, Ortiz is flirting with a record: Billy Hatcher, then of the Cincinnati Reds, set the single-Series batting record in 1990 when he hit .750 (with nine hits in 12 at-bats) against the Oakland A's. 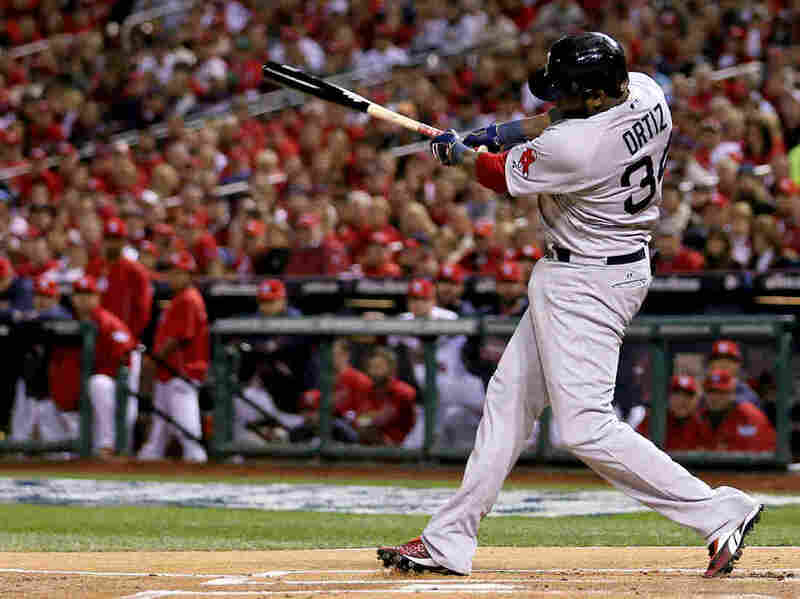 Ortiz, who's known as "Big Papi," has slugged two home runs and has six runs batted in so far in the Series. Other Red Sox players, NPR's Tom Goldman said on Morning Edition, call Ortiz "Cooperstown" — a reference, of course, to the National Baseball Hall of Fame. As for Monday's game, the other big star for Boston was pitcher Jon Lester. The Associated Press writes that he "enhanced his reputation as an October ace with every pitch. He allowed one run and four hits in 7 2-3 innings, striking out seven without a walk."